It is fairly easy and unobtrusive to end users to obtain a memory dump from a running .Net application, in order to track down a memory leak or other anomaly. The actual viewing of the dump is far more complicated. In this post, I will describe how to obtain the dump and the basics of viewing it. At the end there is a reference section that lists other documentation to further help with viewing and finding leaks and other anomalies. 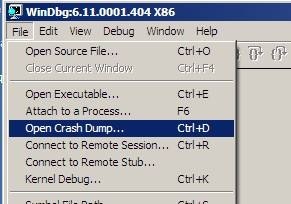 In order to do anything with a memory dump, you need to have the Windows Debugger (WinDbg) installed. The latest version can be downloaded from Microsoft’s web site (http://www.microsoft.com/whdc/devtools/debugging/installx86.mspx). It is a Windows installer – just install as you would any other utility. If you need to obtain a memory dump from a customer or test machine, and do not want to run the installation, you can actually just copy the root directory of the installation to the machine, via a thumb drive or other simple means. 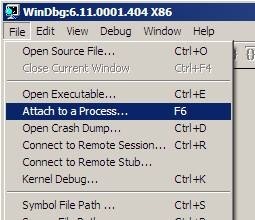 One thing to note before actually proceeding: while you have the debugger attached to the process, the process will not be running. This will be apparent to users, so you will want to make sure you coordinate with them before doing this. Also note that if you do not disconnect the debugger properly, you will terminate the process, which the users will notice. The debugger opens a window. In that window, the top area has the status and command output, the bottom has a line for entering commands. Note that by using the up arrow key, you can scroll back through past commands. You can directly debug the application at this point, if you want, or you can create a memory dump and explore it later. Note that at this point, the application is in break mode, so the users will not be able to use it. What this command means is load the SOS.dll from the same location you loaded the MSCORWKS.dll, which will be the .Net Framework directory. This is far easier than typing the full path to SOS.dll. All of the objects in the heap are listed by their class, in order from least memory usage to greatest, for the object class. It shows the number of instances (count) and the total size of those instances (TotalSize). Note that this is a shallow size – the memory consumed by the object itself, not any child objects it holds. This can be quite deceiving, but it is a good starting point. Here we see the fields that make up the object. Notice that in the Value column, if the field represents another object, the value will be the address of that object. This can show the parent (and further chain upward) of an object, which can be useful.